Hi! My name is Chris and I joined the Music & Arts team in 2018. 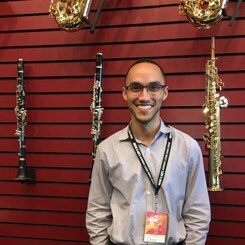 If you have any questions about woodwinds or woodwind accessories, I can help you out! I'm a classically trained clarinetist with a background in Music Education and Performance. I've been playing the clarinet for about 15 years and have performed in a variety of settings including bands, orchestras, chamber ensembles, masterclasses, and solo recitals. In 2013, I was featured on WQXR's Young Artists Showcase as a member of the Round Top International Festival Institute in Round Top, TX. As a woodwind doubler, I've played piccolo, flute, saxophone, and bass clarinet in the pit orchestras for a number of musicals. Currently, I perform with the Westchester Symphonic Winds in Tarrytown, NY where I also serve as secretary on the Board of Directors. Here at Music & Arts, we're all about helping our customers find their unique sound. I hope to see you in our store soon!